“Hardly any other advertising medium is as abused as email marketing. Because hardly any other medium comes as close to the consumer as an email: directly to his virtual living room or his digital office. The email newsletter will finally die if those responsible do not treat it more cautiously, considerately and individually in the future”. This is what the e-business expert Joachim Graf writes in his print service “iBusiness Executive Summary”. He is right. The big chance of electronic newsletters is also their biggest risk: social media marketing, i.e. customer communication via Xing, LinkedIn, Facebook and Twitter, is an alternative to conventional e-mail newsletters and at the same time an excellent supplement. Every German subscribes to an average of 6.3 newsletters (source: Contactlab). E-mail marketing is therefore still a highly relevant marketing instrument. But for some time now, e-mail marketing has been considered less chic than Facebook & Co. That’s unfortunate. As a push medium, e-mailings are an excellent complement to the pull instruments of social media marketing. According to a study by Adobe, more than half of all young adults between the ages of 18 and 24 check their e-mail in the morning while they are still in bed. For Millenials (18-34 years), the Gmail app is the second most important app on their smartphone. Half of US adult consumers still use their first email address. In times of an ever faster changing communications landscape, this is an important date. E-mail addresses become obsolete more slowly than most other addresses. This is another reason why they are worth their weight in gold. So it’s no wonder that four out of five companies in Germany today do email marketing. But only scarcely 70 per cent dispatch over professional E-Mail service provider and still three-quarters of the enterprises uses no Double-Opt-In with the plant of subscribers according to a study of the experts of absolit. We have been working with the email marketing experts of the German AGNITAS AG for many years. 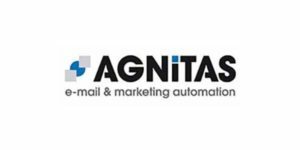 The AGNITAS E-Marketing Manager (EMM) has long been one of the established solutions for the legally compliant sending of email newsletters. Both medium-sized companies such as Käfer and Neopost use the EMM, as do corporations such as Conrad, which regularly send hundreds of thousands of e-mails reliably to their customers via AGNITAS. AGNITAS AG is a member of the German Dialog Marketing Association (Deutscher Dialogmarketing Verband e.V.). (DDV) and the Certified Senders Alliance (CSA). In addition, AGNITAS is committed to complying with DDV’s “Code of Ethics for E-Mail Marketing”. This also guarantees our customers a high quality standard for their e-mail marketing and whitelisting. But the EMM is not only legally secure – it is also state-of-the-art. It can do much more than just send e-mails. It is the core of a modern Digital Push Marketing Suite and integrates SMS, Fax, WhatsApp and Facebook Messenger. And as one of the very few tools, it also integrates modern Web Push Services. So you can reach consumers directly while surfing the web – via an overlay window. Once your prospect or customer has signed up for the notification service on your website, he or she receives your short messages directly while surfing via the web browser. It doesn’t matter on which website they are, the browser only has to be open in the background. vibrio is an AGNITAS partner and provides its customers the full functionality of the EMM. Because e-mail marketing is a central pillar in the modern marketing mix.